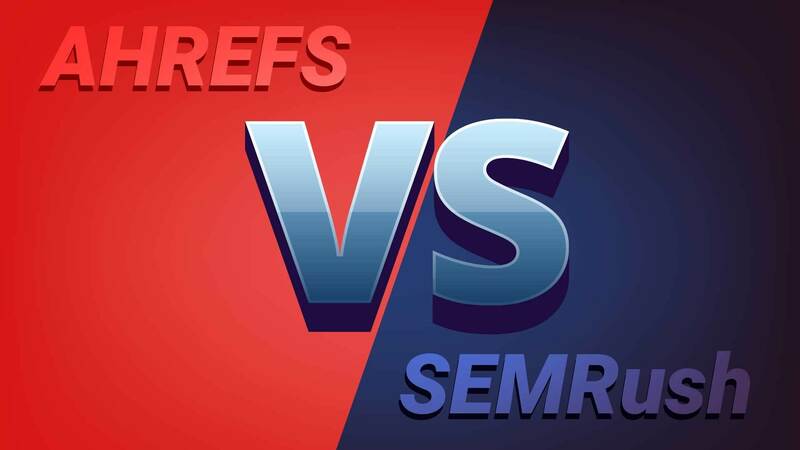 Ahrefs vs SEMRush SEO Showdown: Who ranks it better? SEMRush and Ahrefs are both fantastic tools to monitor and manage your website’s search performance, keywords, backlinks, competitors, and more. Whether you’re looking to boost your page rankings or provide natural SEO services for clients, you can’t go wrong with either platform. However, there are some pros and cons to both platforms, and some quirks, too. So read on to discover which may be the best SEO tool for running managing your SEO program. SEMRush offers a fantastic dashboard of insights that give you a quick overview of all your campaigns. Enter your competitors’ or clients’ sites to a domain overview and viola – you’ve got a simple way to measure how sites stack up against eachother in terms of keywords and backlinks. SEMRush offers a full suite of backlink tools allowing you to disavow toxic links, monitor brand mentions, and seek potential new link building opportunities. And I'm sure you know how important backlinks are to your SEO strategy. There are also white label tools to run audits, so you can give monthly reports to your current clients, offer an audit to a prospect, or just use the tool to gain better insights on your current projects. SEMRush can sometimes be a pain to navigate around, but an experienced user will take advantage of all the neat shortcuts and tools that SEMRush has built in. There is a much steeper learning curve to working with SEMRush than Ahrefs, but that’s only because of how many robust features they offer. We have also found some odd quirks in the data when compared to other sources like Google Analytics and Search Console, which can be frustrating when trying to explain software anomalies to a client. You also want the most accurate reporting, and SEMRush sometimes lacks that. The dashboard on Ahrefs is a breath of fresh air after working with SEMRush for years. It’s not quite as robust as SEMRush in terms of features, but Ahrefs distills the information down much easier. This makes search analysis seem more actionable, which is a big deal for our agency. I have a real appreciation for all the interactive graphs and charts that Ahrefs offers. It’s easy to get a full understanding of the value that SEO is providing your business. You can quickly get a great overview of average keyword position, backlinks, and search visibility against your top competitors. Both platforms offer similar tools to monitor mentions, backlinks, and potential opportunities. Ahrefs just recently released a new beta version of their keyword explorer that allows you to research keywords based on the channel, such as Google, Amazon, YouTube, Bing, Yahoo, and many more. This is extremely useful because all of these data points should work harmoniously together when building out an effective ecommerce SEO strategy. And when we say ecommerce, we’re mostly talking about Amazon. This is gives a huge advantage to Ahrefs, as SEMRush’s magic keyword tool isn’t quite as impactful as Google’s own free keyword tool. SEMRush has fantastic reporting tools, making it very easy to spit out a website audit in seconds. Addressing as many issues as possible from the audit will always net you some SEO gains. And your developers will never forget to miss an H1 tag again. The reporting is extremely robust, and you can tell a lot of different stories with all of the information that’s available to you from the report. This is where SEMRush really shines, and quite frankly where Ahrefs really doesn’t. Ahrefs is still a fairly new program, and I expect for the reporting to continue to improve. Ahrefs continually releases new innovative updates, like the auditing and keyword tools. I really hope a lot of their effort goes towards better reporting. Within its current offering, the reports just aren’t robust enough when compared to SEMRush. There also isn’t the level of customization (if any at all) when it comes to the reports. Instead of building a report with all of the elements that are relevant to the project, you must pull individual PDFs or Excel documents for each separate element. On the other hand, SEMRush gives you the ability to tinker with certain variables within almost every reporting widget. Oddly enough, Ahrefs has a huge focus on backlinks and not enough reporting around keywords. Some basic website analytics that are always nice to include in every report. SEMRush starts off at $99 a month, which is probably suitable for just managing a single site. If you work solo, but manage multiple SEO campaigns, the $199 a month option is for you. You can manage up to 50 projects with 1500 trackable keywords. If you need access for a team, this is where SEMRush can get super expensive. The next tier up is $400, with each additional user costing $140. There’s no way to use a single login for multiple users as it’ll kick you out as soon as it detects a new user logging in. Ahrefs doesn’t fair much better in the pricing department. The base $99 tier only includes 5 projects, and the following tier is $179 for 10 projects. If you’re a small agency you won’t be able to get away with anything less than the $399 tier which includes 25 projects and up to 3 users. When logging in as an additional user on a single-user plan, we didn’t get kicked out too often. We would still get booted on occasion, but not the swift immediate action that SEMRush would take. SEMRush would cost at $480 for a similar package for 3 users. Neither platform is cheap, so I wouldn’t make price a determining factor for picking platforms. So which SEO tool do we recommend? There is no wrong decision here, but our current favorite tool is Ahrefs. One factor that we overlook with SEMRush was the inconsistencies within the data. SEMRUsh didn’t seem to crawl and mine as much data as Ahrefs, or even as well as Ahrefs. There was a noticeable difference in the amount of keywords Ahrefs could scan, and in many cases it was over 100% more keywords. We noticed less discrepancies when comparing Ahrefs to other data sources, like Google tools.. The overall ease-of-use also made Ahrefs an easy pick. Despite its shortcomings in the reporting area, we still believe it packs the most useful suite of tooling to manage your SEO campaigns. In turn, we’ve managed to create our own custom reporting tools using the most important KPI’s, which distills reporting down much easier for the clients to consume.